These socks showcase once-banned titles on one sock and bold "censored" strike-throughs on the other. The Great Gatsby, Lord of the Flies, To Kill a Mockingbird--they all might be well-loved classics, but they have something else in common: they were all banned books at one point. 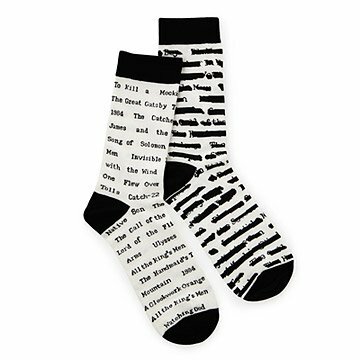 Featuring the previously-banned titles on one sock and bold crossed out "censoring" on the other, this literary set is perfect for the book lover with a taste for breaking the rules. Made in China. The idea behind the socks is super creative. I wanted these because of the books listed and I love socks! I have used these to lounge and to go out, with leggings and chucks so people could see the socks. Best socks ever! I'm a collector of funky and unique socks. Why wear boring? But with a size 9.5 foot.....and most womens socks being universal size 5-9(10)......they often are too tight, and too short. Socks coming in 2 sizes is a game changer! No tight sock lines around my ankle (which aren't fat!) and the length is perfect. Plus - how fun are they? I will be collecting all the uncommon good socks in this new found size. My sister uses these with loafers when she goes out or just for around the house. Clever and Perfect for the Bookworm! My sister-in-law is a voracious reader as well as a librarian, and she loves fun socks. This was the best stocking stuffer ever! The socks are practical, in that they are well made and comfortable, but they're also fun and a good conversation starter. Disappointed in the mismatch aspect. Most disappointing gift ever get from such a great site! Unable to use the product - does not meet my high personal standard for gift giving. Sitting in the closet instead.